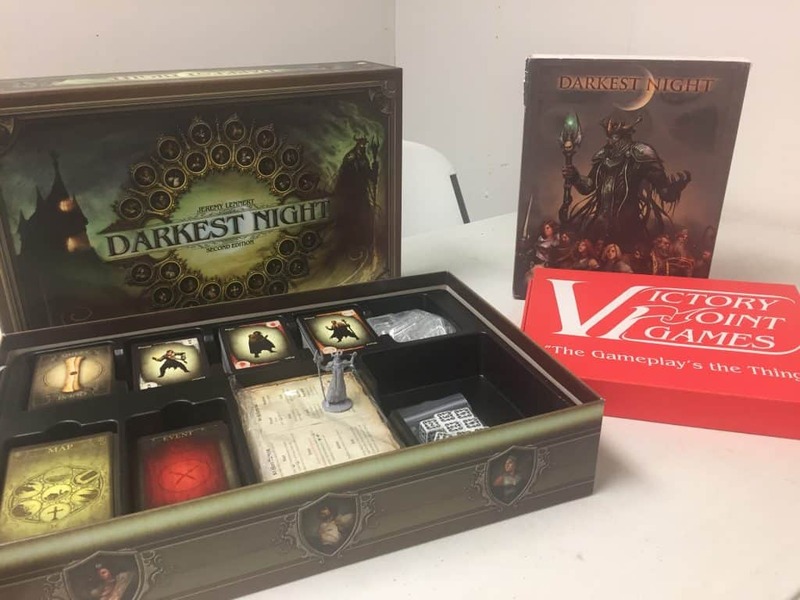 Darkest Night is a cooperative game in a fantasy setting for 1-4 players, designed by Jeremy Lennert and published by Victory Point Games. For quite a long time, gamers knew Victory Point Games for two things: fun gameplay from their games, and for a level of print quality that could charitably be described as… not so excellent. 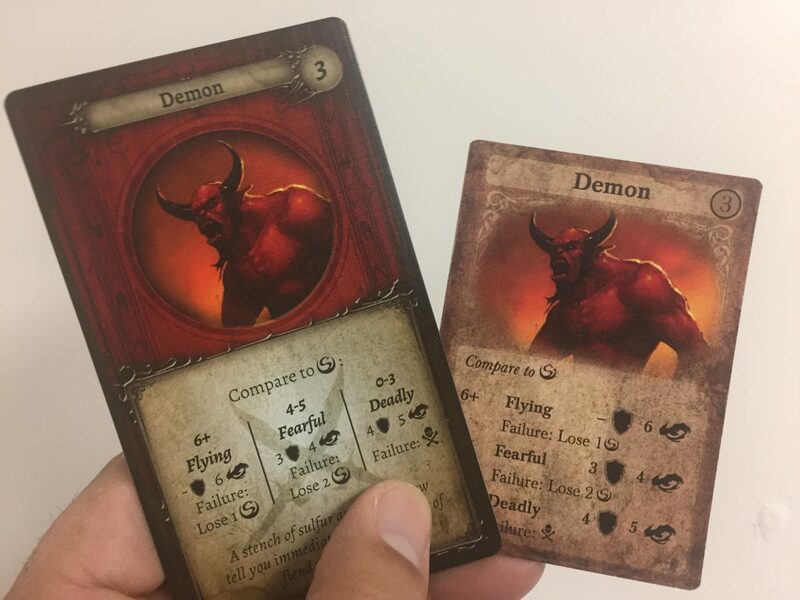 VPG printed and packaged their games in-house, often resulting in sooty token sheets, substandard paper quality, and game boxes that looked like they were borrowed from a pizza shop. While some gamers looked past the component issues to focus on the games themselves, others found those issues more problematic. 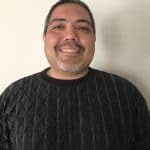 In this context, Victory Point Games recently launched their “Premiere Line” initiative, in which they revisited their most popular titles for the sake of providing a deluxe print experience. Dawn of the Zeds was printed this way, as well as the very successful Nemo’s War. Up next in the Premiere Line is Darkest Night. Originally published in 2012, the game proved popular enough to warrant five expansions. It also inspired a small yet loyal following among fans of cooperative games. 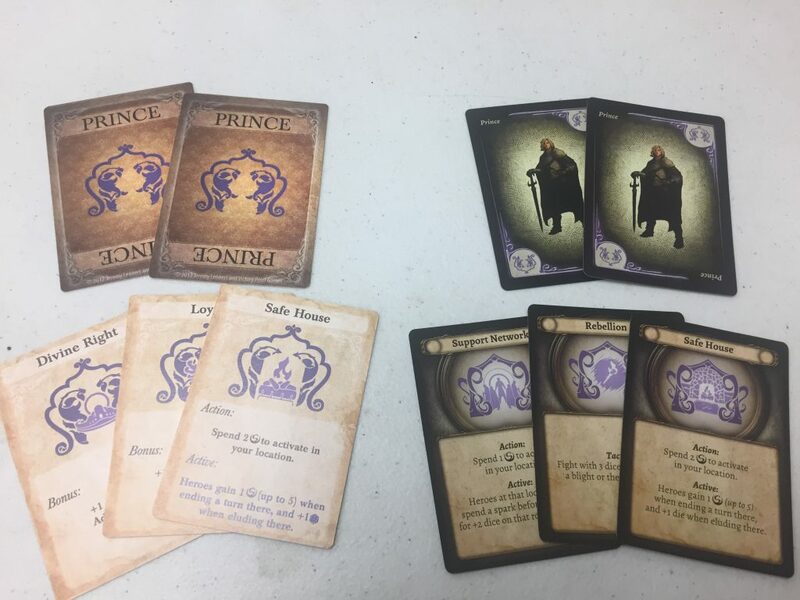 Darkest Night Second Edition promised to massively upgrade the component quality, as well as include the lion’s share of the content from the previous five expansions. Does the Second Edition deliver on all it promised? Does its gameplay warrant the “Premiere” print treatment? When I shared out some of these photos on social media, people reacted in different ways. Some really appreciated the new look. Others said that they missed the more gritty, Gothic vibe of the first edition. What the photos do not show, though, is the massive improvement in tactile quality. 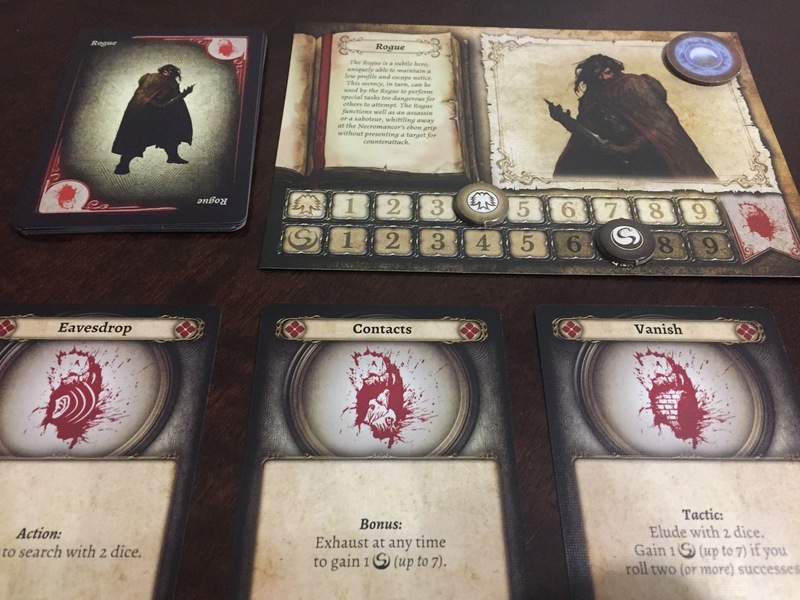 Playing a game of Darkest Night Second Edition feels really, really good! It’s also much easier on the eyes since the board, the tarot-sized event cards, and the standees (pretty much all the important stuff) are now bigger and clearer. 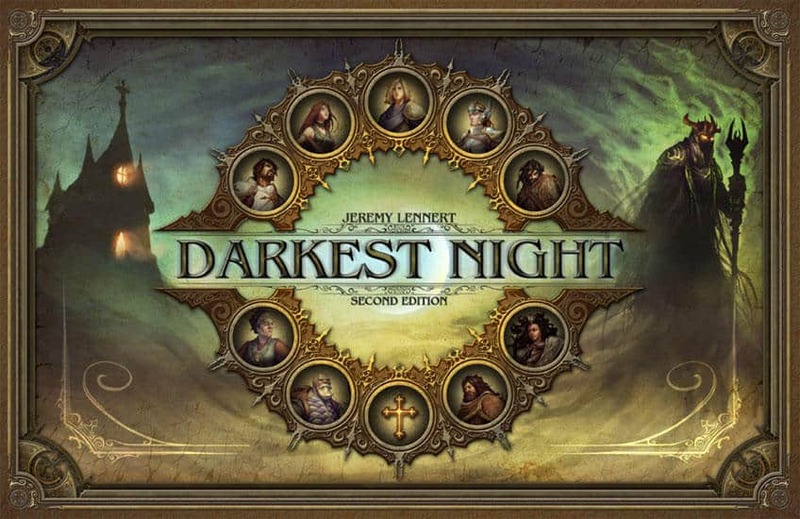 In addition, Darkest Night Second Edition contains almost all of the gameplay content from the five previous expansions. You get 29 different heroes, a giant stack of event cards, as well as some decks and tokens from the later expansions that change up gameplay. Further, while the current MSRP might make you blink twice, it costs about the same as the previous edition with all of its expansions. So, if you are late to the Darkest Night party, you could pick up the second edition and feel reasonably confident that you haven’t missed anything. Overview: In Darkest Night, you play a hero in an unnamed fantasy land. Unlike in many similar games where you defend the land against some kind of monstrous menace, the world here has already been conquered by a Necromancer. He basically has the run of the place and can spread his blight pretty much wherever he chooses. Your Darkest Night hero, therefore, is a resistance fighter seeking to defeat him and save what’s left of humanity. Player characters: Your character sheet consists of a player board where you could track your grace (health) and secrecy (which you use to avoid the Necromancer – more on that later). You also get a deck of 13 cards that contain your player powers. You start with three basic powers, and you can eventually draw more as you play. 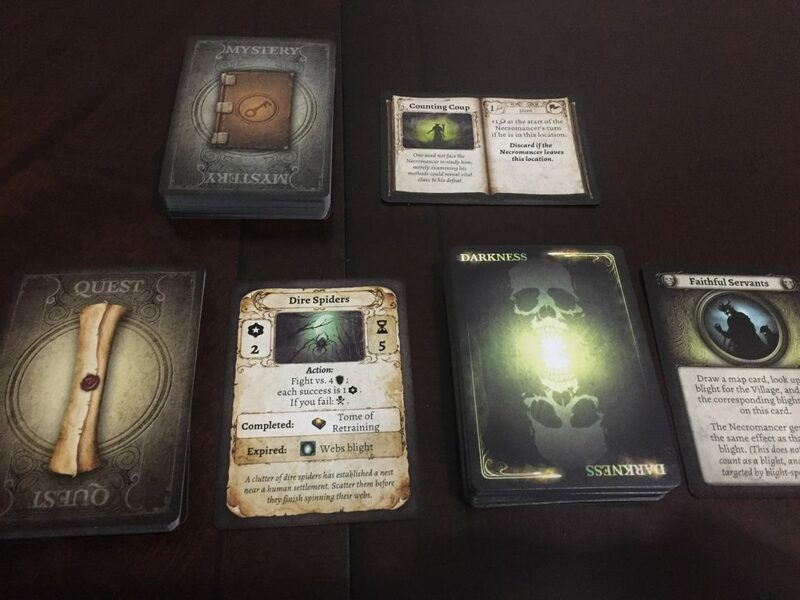 Unlike other, similar cooperative games like Pandemic or Arkham Horror, the power decks in Darkest Night give you lots of room to develop and progress your character as you prepare to beat the Necromancer. One thing to note about the player characters – you MUST use four of them in the basic game. 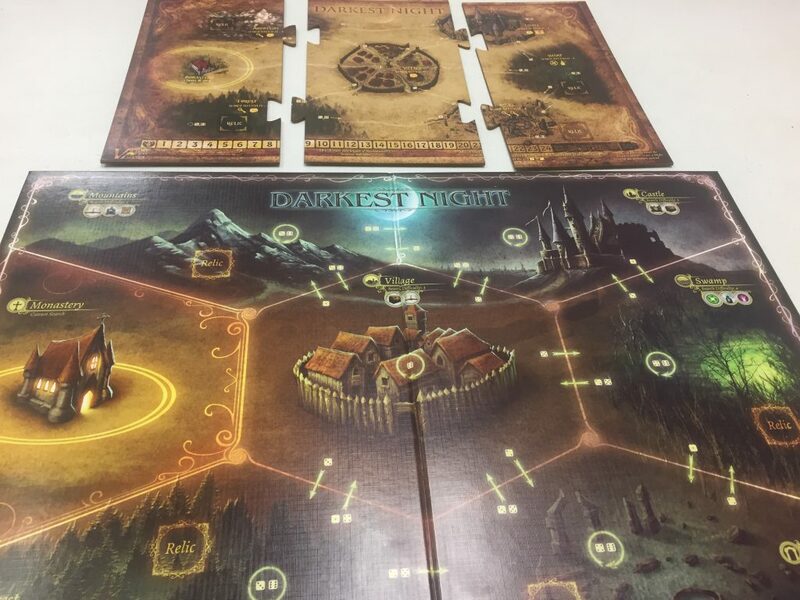 Darkest Night is tuned for four characters completing actions around the board. 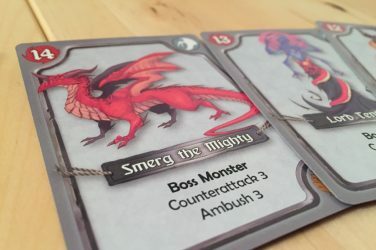 If you want to play with fewer characters, then you have to make some mechanical adjustments based on guidelines printed near the end of the rulebook. The Necromancer and his Blight: The Necromancer represents the “Big Bad” the players seek to defeat. 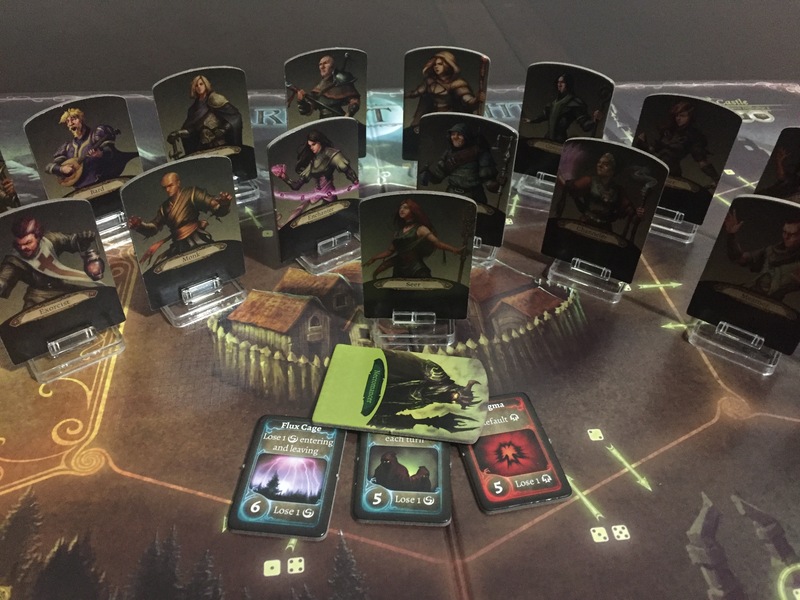 Unlike the aforementioned Pandemic or Arkham Horror, the Necromancer is a real piece on the board that moves around and interacts with the players. For most of the game, he’s an unkillable death machine that moves around the board. If you start the round in his square, he saps one secrecy from you. Once you hit zero on your secrecy track, he starts to attack you. You have to roll a 7 on a 6-sided die to kill him, which is plainly impossible. Instead, you have to evade him (which takes a roll of 6) for the time being. Everywhere the Necromancer stops, he spreads blight. The blight tokens serve the same basic function as the disease cubes in Pandemic, only these tokens all have special powers that affect the board in some way. Either they represent monsters who attack you, or they create negative local or global effects. If you let too much blight pile up in one spot, it starts to overflow and spread to the one safe spot on the entire board – your monastery. If the monastery ever fills up with blight, you lose. Gotta stay on top of that blight! 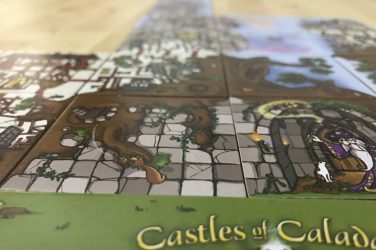 Game turns and Victory: Basic game flow resembles yet another cooperative game, Shadows over Camelot. On your turn, you pull from a deck of bad things and suffer some woe, then you take one action. You can use you action to move one space, try to remove a blight token, search for clues or treasure, increase your secrecy to hide from the Necromancer, or use one of your special player powers. When you either search or fight, you roll a six sided die (hopefully more than one with the right buffs and powers) and compare the result to a level of difficulty set by the board (for searches) or the blight token (for fights). 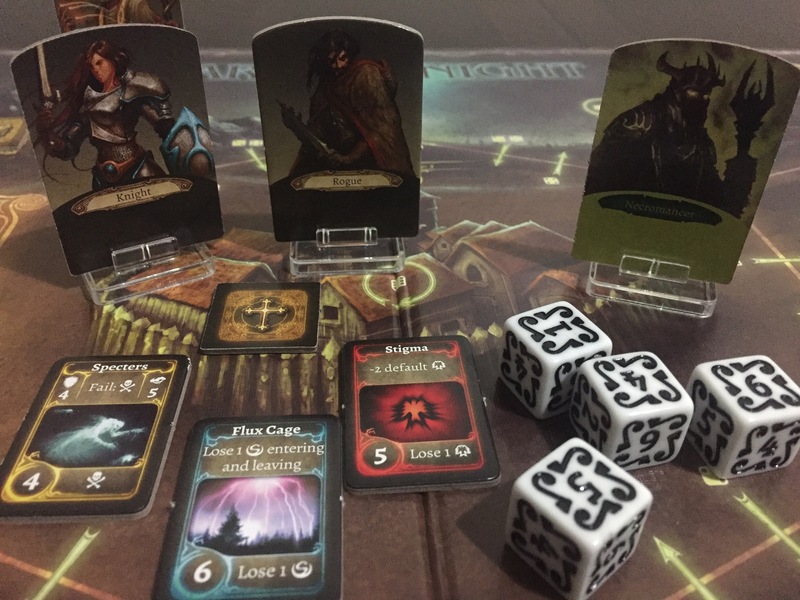 Darkest Night and dice rolling are very, very good friends. You roll dice to resolve pretty much anything. Further, there’s not a lot of opportunity to manipulate those rolls. If you want to insure success, you need to be able to roll more dice or reroll the ones you have. Successful fights don’t give you anything positive; they simply mean you can take some blight off of the board. Successful searches, however, can earn you items, extra draws from your power deck, or clues to advance the game’s narrative. If you get enough clues, you can find the Holy Relic that gives +1 to any one dice roll. Therefore, the Holy Relic is pretty much the only thing in the game that allows you to roll the 7 you need to beat the Necromancer. If you manage to kill the Necromancer in combat, you win the game. You can also win with enough successful searches, but killing the necromancer is more fun! Extras: There’s a lot more to the game that I won’t describe in detail. You can shuffle in side quests and clue mystery cards to make your journey a bit more interesting. The Necromancer also has his own deck which makes him more powerful as the game progresses. 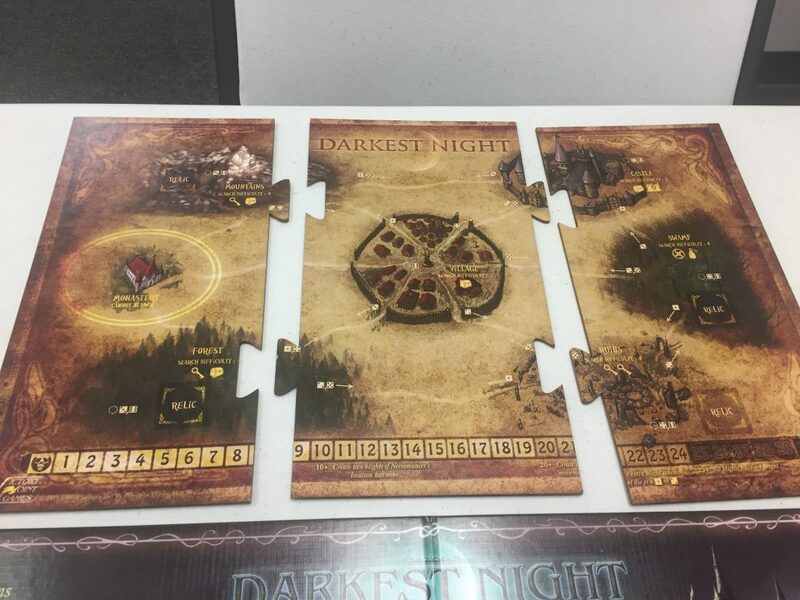 All of these additional pieces were added into Darkest Night via expansions, but are presented as part of the core Second Edition experience. If you want a simpler, faster game, you can simply remove these pieces following guidelines at the end of the rulebook. 1. Excellent ambiance and mood. 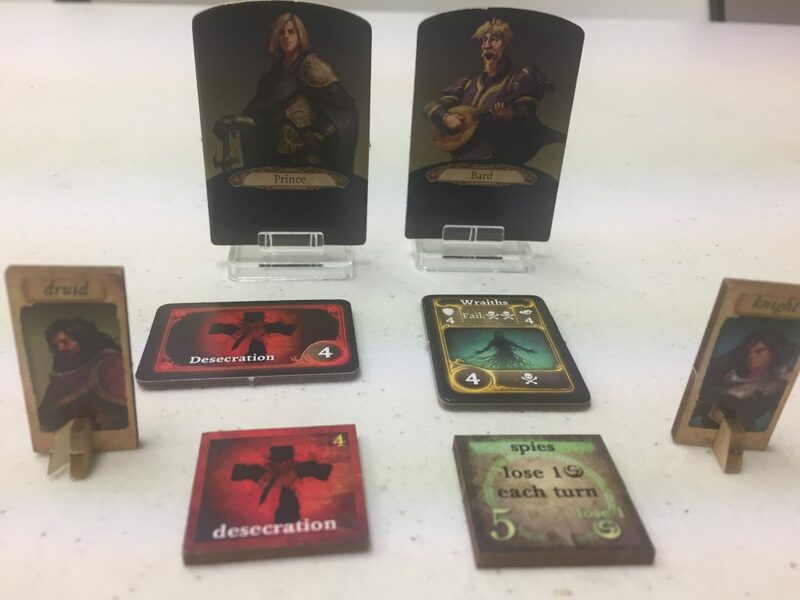 Whether you enjoyed the art of the first or second edition, I felt both incarnations of the art promoted a sense that the Necromancer was in charge of this world. 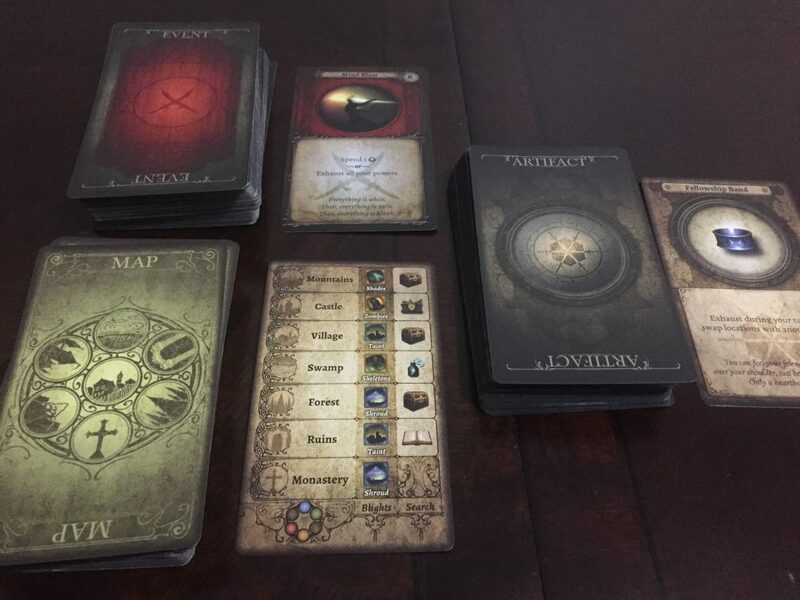 The second edition, in particular, managed to hit a sweet spot; it presents dark moody art on the board and cards, while still remaining clear and easy to read. The Necromancer piece, in particular, delivers great theme while working and making sense as a mechanism. Where in other games, the disease cubes or open gates pop up randomly, the Necromancer moves around the board and inflicts pain wherever he goes. It’s very visual and easy to understand, which really pays off when I teach the game. As the party does heroic stuff in the land and lowers their secrecy track, the Necromancer will just move towards that character and try to find him. This enables a lot of tactical decisions that, at the same time, feel very thematic. One character, for example, could walk around with no secrecy at all to draw the Necromancer’s attention for a few turns, allowing others to complete searches or clear out blight in other areas. You can also cover for a friend who gets hurt really badly by lots or blight, or poor dice rolling. There’s a lot of meat on the bone here. 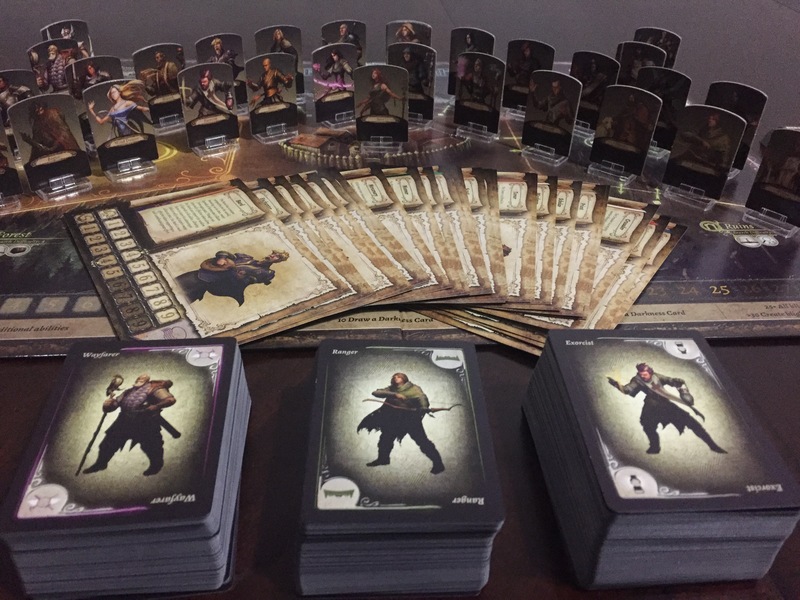 29 characters in the second edition box! Holy buckets! While I haven’t tried all of them quite yet, I am really impressed by how different they all feel. The Bard tags along with folks and throws out buffs. The Rogue uses his secrecy track either to sneak around the Necromancer, or to give extra umph to his attacks. The Wizard has more impactful powers, but they exhaust and need to be refreshed. The Scholar’s gets power-ups that immediately impact the space he’s on, so he needs to be mindful of his location when he gets his power-ups. 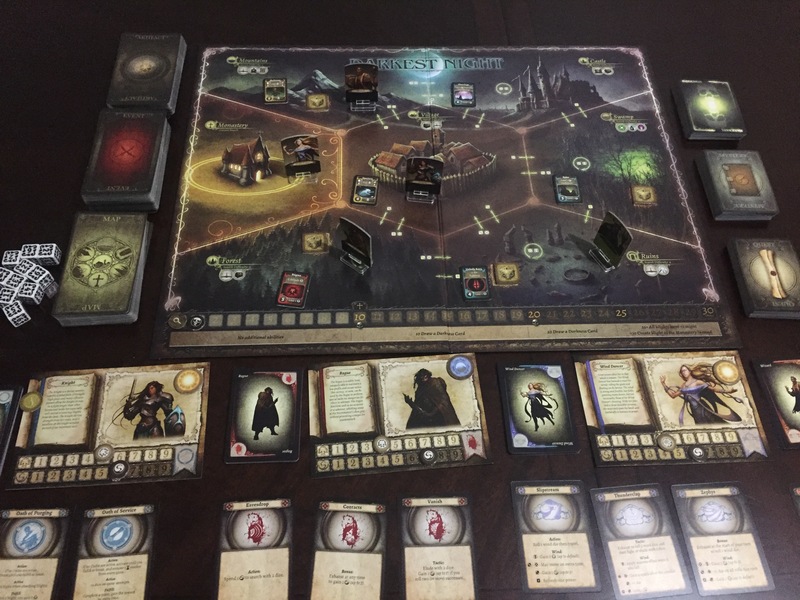 You can play games of Darkest Night with different characters and have completely different tactical experiences each time. This is distinct from Darkest Night’s older brother, Arkham Horror; the gameplay variety there comes, not from the characters, but from the different monsters and scenarios. I’m not saying that either way is better or worse. I simply appreciated how Darkest Night found a way to shift the focus around and create its own, very satisfying experience. 4. Genuine Cooperation Among Characters (thanks to commenters on BGG for pointing this out). In a way, Darkest Night forces genuine interaction among by only allowing limited actions (more on that below). You don’t have a lot of actions to waste, so you have to communicate to make the most of your overall rounds. One example I mentioned above – making sure you coordinate to handle the Necromancer. In addition, the 29 different classes themselves allow plenty of fun ways to interact. I especially enjoy classes like the Bard, Cleric, Prince, and others, who act as buffbots to enable the awesomness for your friends (I might be a bit biased towards these classes though – my favorite Pandemic class is the Dispatcher). 1. Games can run too long. For some games of Darkest Night, everything comes together. Searches reveal all of the clues you need. You control the Necromancer’s blights reasonably effectively. You then pick up the Holy Relic and defeat the Necromancer in short order. I point this out because, if ANY of these phases of the game doesn’t work out in the ideal way, you might get stuck playing longer than you want to. A full four player game might take up to two hours or longer, which is FAR too long for this game. Darkest Night is less like Arkham Horror (where there’s a lot more narrative baked in the game) and more like Pandemic in that it excels as a one hour experience. What’s the main culprit for games lasting too long? 2. Too much dependence on dice luck. Like Arkham Horror before it, Darkest Night proudly wears its Amerithrash-ness as a badge of honor. Every meaningful search or combat in this game involves a dice roll. 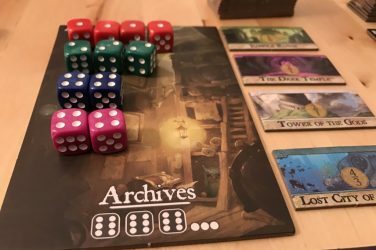 The fifth expansion of the first addition added a “spark” mechanism which lets you add dice to any roll, which is a very much welcome innovation that the second edition has ported in here. Notwithstanding, there’s still no real mitigation or manipulation. You roll what you roll. Not every gamer loves this style of play, so buyer beware. For me, I loved the theme integration so much here that I can look past it. Along with the failures, I’ve had some rousing, memorable successes! Which, I suppose, is the whole point of dice resolution. However, I’ve had games that have run long solely because of dice rolls. 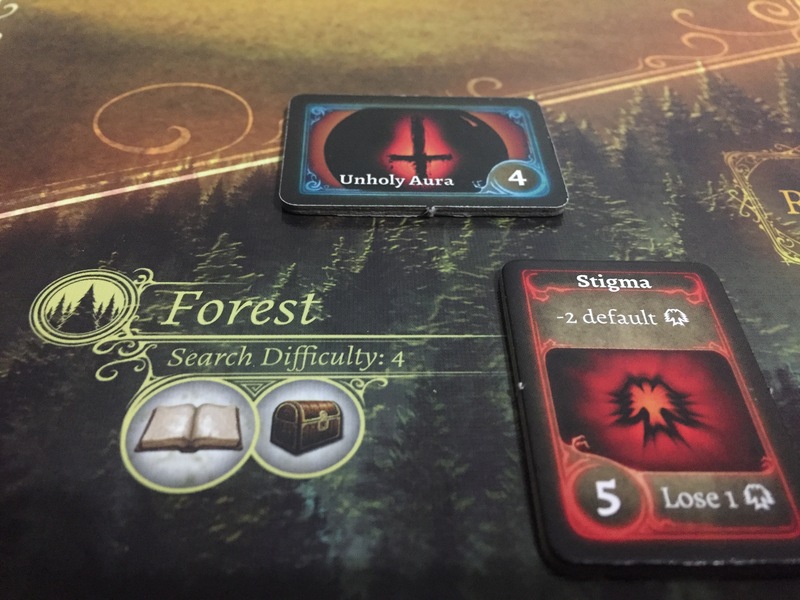 If you roll poorly against the blight token that protects every other blight token on the board, or if you consistently pull treasures and power ups instead of clues from the search deck, or… well, if any number of things happen, that all adds time to the game. The luck factor can really hit you hard at the end of the game. In order to have a good chance to beat the Necromancer, you need to devote multiple turns to proper setup – lining up power cooldowns and buffs, clearing the area of blight, etc. You only need to roll one 6 out of however many dice to beat him. If you miss that roll, then you need to spend another cluster of turns setting all of that up again. What should be a rousing climax to a fun game can turn into a real slog. 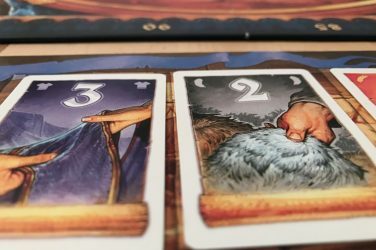 In many cooperative games, movement constitutes either one among a series of actions you can take on a turn, or it’s a separate phase altogether. In Darkest Night, you only get one action per turn. If you spend that action just moving, then that particular turn can feel very unsatisfying. Further, if another player spends his or her turn either mired in AP or resolving a series of rolls, then a long time could go by before you go again and have a chance to actually do something effective. This isn’t a dealbreaker in the long run; it simply stands out as an issue because other cooperative games handle this much better. If you want to just lay the game on the table and play with one friend, of if you want to play the game solo with only two characters, then you have to go through a whole litany of mechanical changes, both in setup and during gameplay. At one or two players, whether you manage all four characters or play with the proposed “dual class” characters, both options add a ton of tracking and clunky-ness to a game that’s already prone to running long. Final Verdict/ Who is Darkest Night for? Darkest Night isn’t for everybody. It relies on dice perhaps too much, it can run long, and its price might be a barrier for some folks. 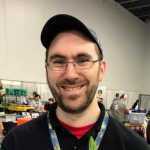 And at the end of the day, it delivers a similar cooperative experience as some of the big tentpole coops in the genre – Pandemic, Arkham Horror, etc. 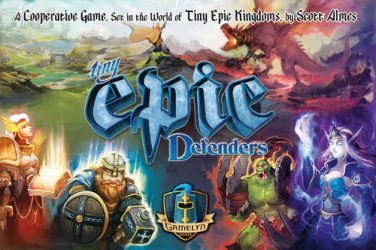 However, if you love cooperative games and/ or fantasy themes, then I would definitely recommend checking this one out. The print quality really makes the overall aesthetic of the game pop out. 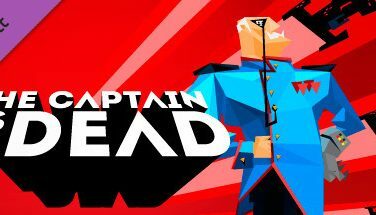 In terms of gameplay, I think it stands out among similar games in terms of theme integration into mechanisms and the very, very wide variety of character options. Final Verdict (scale of Buy/ Pay/ Dodge/ Burn): Play! Or Buy if you have the cash and like fantasy and/ or co-op games.